American surgeon Caitlin O'Donahue nearly lost her life during volunteer work in the jungles of El Salvador. She escapes to her childhood ranch, but the place that was once safe now seems dangerous. 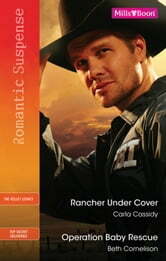 The only man she can trust is a gorgeous rancher with an agenda and deep–set secrets. Elise Norris wants nothing more than to be a mother. But her joy turns to agony when newborn baby girl Grace dies mysteriously. Grieving himself, widower Jared Coleman and his daughter become captivated by Elise. But while investigating the strange circumstances behind Grace's death, their new friend teeters close to an explosive secret. Can Jared protect her or is he over his head in a desperate struggle?